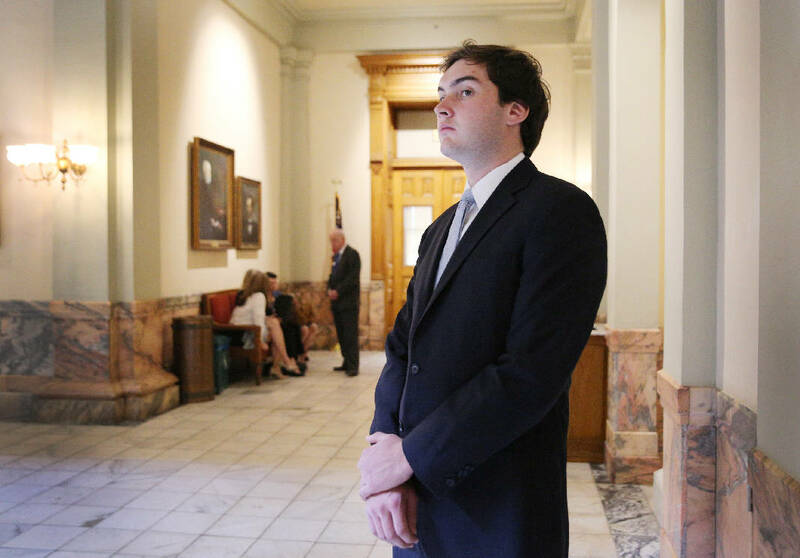 Staff photo by Erin O. Smith / Colton Moore, 24, watches a ceremony happening in a lobby area of the Georgia State Capitol Thursday, March 29, 2018 in Atlanta, Ga. Moore, who is a candidate in the upcoming election for the District 1 House of Representatives seat in Georgia, was spending a few days at the Capitol to better prepare himself to take on the job should he win the election later this year. Former Gov. Nathan Deal's criminal justice reform efforts will be set in stone later this year, when the state's new judicial complex opens. Georgia's House of Representatives overwhelmingly passed a resolution Wednesday to name the building after him, voting 159-2. One of those two lawmakers on the negative side? Freshman State Rep. Colton Moore, R-Trenton. Moore told the Times Free Press he didn't believe the building should be named after anybody, and Deal's criminal justice reforms didn't go far enough. "There are poor, broke and damned people in the state of Georgia that are not receiving justice," he said. "Until we can find a true leader in justice reform, we shouldn't rush to name the building the Nathan Deal Justice Center just because he is our recent governor. He should not be the symbol of justice for our state." Criminal justice reform was the marquee effort of Deal's time as governor. When he took office in 2011, Georgia's incarceration rate was the fourth-highest in the country. It was also on track to grow by 8 percent in five years, putting the total population at 60,000. The state prepared to build two new prisons at a cost of about $260 million. Deal appropriated millions to open accountability courts across the state, offering alternatives to prison sentences. In the Lookout Mountain Judicial Circuit, local judges now oversee a drug court and a parental accountability court, which is aimed at divorced parents who are behind on child support. With Deal in office, the state also tweaked some sentencing laws — for example, Georgia now has more punishment thresholds for drug possession, with the intention of keeping people out of jail if they are caught with low quantities. Tisdale resisted an officer as he arrested her, though a jury later acquitted her of felony obstruction and misdemeanor trespass charges. She was convicted of misdemeanor obstruction and sentenced to 12 months probation. Before the trial, Deal was subpoenaed to testify. But a judge later ruled he did not have to come to court. Moore grabbed attention with Wednesday's vote — and also for whom he was aligned with. The other "no" vote came from State. Rep. Matt Gurtler, R-Tiger, a frequent critic of Republican leadership. During Gurtler's re-election campaign last year, Speaker of the House David Ralston contributed to his opponent's campaign. Moore and Gurtler happen to be roommates in Atlanta during this legislative session. After Moore's vote, reporters with the Atlanta Journal-Constitution noted his diverse set of jobs, which includes truck driver and auctioneer. "[Moore] can now add irrelevant state lawmaker to his list of occupations," the reporter wrote. "You do not cross the House speaker, a man of your own party, on an innocuous bit of legislation with the expectation of future rewards." When it opens later this year, the Nathan Deal Judicial Center will hold the Georgia Supreme Court and Georgia Court of Appeals.